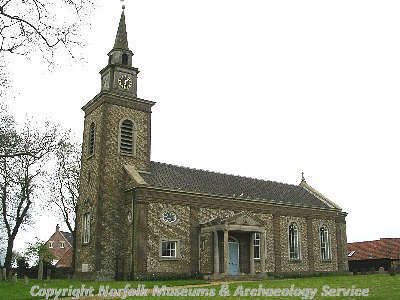 Bawdeswell is located in Breckland, close to the centre of Norfolk and about 7km northeast of Dereham. Most of the parish is on a low plateau. It slopes away in the southwest towards the River Wensum. In the northeast there is a gently sloping valley focused on the Sparham stream. Modern settlement is clustered in the centre at Bawdeswell village, with farms and house scattered throughout the rest of the parish. A number of prehistoric flint artefacts have been found in Bawdeswell. They include Neolithic objects, a Neolithic flaked flint axehead, two Neolithic or Bronze Age barbed and tanged arrowheads and a scatter of pot boilers. A cremation of possible prehistoric date (NHER 34163) was found during an excavation in Bawdeswell village. A follow up excavation revealed no more and suggested that the cremation was an isolated example. However, it may not have been the only prehistoric burial in the parish. A mound (NHER 18364) visible on two post medieval estate maps may well have been a Bronze Age barrow. A Roman road (NHER 2796) passes east to west through the centre of Bawdeswell. This major Roman route begins in the Fens at Upwell, passes through Denver and which continues to Brampton in northeast Norfolk. A road (NHER 14228) that appears on post medieval maps and which may be Roman in origin branches away from the Fen Causeway and follows the southwestern parish boundary for most of its length. Field boundary ditches of Roman date (NHER 34163) have been excavated in the centre of the parish. A Roman cosmetic palette, two Roman coins, a pin that may be Roman and an Iron Age or Roman terret have also been found close by. In 1743 human bones were found in the southeast of the parish, although exactly where is unclear (NHER 3000 and/or 3001). It has been suggested that they came from burials of Early Saxon date, although this is not known for certain. Early Saxon objects have been found at two locations in the parish and include a wrist clasp and part of a 6th century cruciform brooch. No Middle Saxon finds have been recorded in Bawdeswell and only one Late Saxon object, a key, has been recovered. Bawdeswell is called ‘Balderwella’ in the Domesday Book. This is an Old English name meaning ‘Baldhere’s spring’. In 1086 Alfheah and Godric held Bawdeswell for Count Alan. Thirteen freemen, three and a half ploughs, meadow, woodland and ten pigs are recorded. Until the mid 20th century a medieval church stood in Bawdeswell village, where All Saints’ Church (NHER 7216) is today. In November 1944 an RAF plane returning from a raid in Germany crashed and destroyed the building. A replacement church, the existing Georgian style building, was built in 1952. In 1999 medieval quarry pits were excavated in the centre of the parish (NHER 34163). Medieval pottery has been at sites in Bawdeswell village and from places close by. Metal detectorists have collected medieval and post medieval artefacts at locations throughout the parish. Chaucer House (NHER 16982) and the Willows (NHER 17985) are late medieval houses with post medieval additions. In 1944 Chaucer House was struck and damaged by the plane that crashed into the church. It has an associated 18th century icehouse. Surviving post-medieval buildings include the Tollhouse, The Gables, Cobblers Cottages, 6 to 8 Reepham Road, May Tree Farm and Wood Farm. Bawdeswell Hall (NHER 3157) is located in the southeast of the parish. It is a 17th century great house with 19th century refurbishments and a number of Tudor style chimneys. A windmill (NHER 15231) once stood close to the junction of the A1067 and the B1145. It was first recorded in 1753 and was last used about 1845. An undated banked enclosure on Bawdeswell Heath (NHER 7208) may be post medieval in date. There is a modern cast iron telephone kiosk (NHER 44683) close to the church. David Robertson (NLA), 14 September 2005.
http://www.bawdeswell.churchnorfolk.com/. 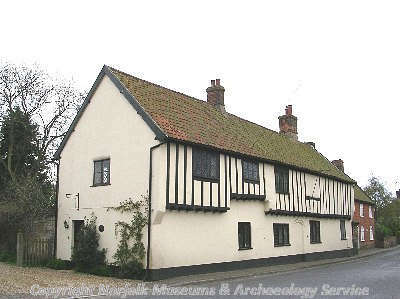 Accessed 14 September 2005.
http://www.about-norfolk.com/about/towns/Bawdeswell.htm. Accessed 14 September 2005.
http://www.norfolkchurches.co.uk/bawdeswell/bawdeswell.htm. Accessed 14 September 2005. Knott, S., 2004. 'The churches of Bawdeswell, Booton and Heydon'. Available: http://www.norfolkchurches.co.uk/fantasy/fantasyintro.htm. Accessed 14 September 2005.